Boss Craig McAllister admits Gosport Borough could do without having a Southern League Cup trip to Winchester City tonight. The Privett Park side face a big FA Cup tie on Saturday at Sittingbourne. It means they need to ensure their main players are fit and fresh for that. McAllister will look at ways of shuffling his pack for the match tonight (7.45pm). He said: ‘This is a big week for us and in some ways this is a game we could very much do without. ‘There have been a lot of games in the last few weeks. As a result we have a few hurting bodies in the squad that need resting. ‘Also our FA Cup tie at the weekend has to take priority. Our game at Sittingbourne is a difficult one but one we can win. ‘I expect to make five or six changes from the team that won at the weekend. ‘The players know we will need to use all of our squad during the season. There will be times when injuries and suspensions will kick in. ‘All the players will get a chance at some point. It is down to them to take it. ‘This game will give me a chance to have a look at a few players who have not been starting so far. Winchester City will present Borough with a difficult assignment. 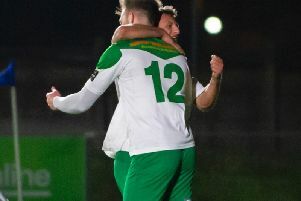 They have made an unbeaten start to the season and are second in Southern League division one south. McAllister wants to see Borough earn their first success on the road against their southern division hosts. He added: ‘Keeping a clean sheet is at the top of our agenda. This will be the perfect time to get a first away win.